Personally, I would have liked to have a bit more time before writing an actual review for the ASG-1(.1)'s but I've decided that I will send them back along with my ear impressions for the AS-1b to be updated into the ASG-1 revision 1.2. So this review will be, in a way "part 1" of the ASG-1 review. The ASG-1 did not come back revised but was upgraded to the ASG-1S and the AS-1b will not be coming. Instead, I will be receiving an AS-2. Also this review is based off of both the EQ'ed and non EQ'ed sound. There is something I must clear up before talking about anything else. THESE IEM'S WERE DESIGNED SPECIFICALLY FOR MUSICIANS(specifically vocalists) therefore THE SOUND WILL NOT BE FOR EVERYONE. I cannot exaggerate this enough, remembering the original target audience is absolutely key whenever you read anything in regards to these IEM's. Listening to the ASG-1 without EQ is like taking a gamble. Some songs will sound terrible, others will sound absolutely amazing. I'm not sure how well focused the picture is but you should be able to see the rings left but the manufacturing process of the ASG-1s. But don't worry, Dale says more aesthetic options are coming soon. UPDATE: After some amount of use, the cables have started to turn green due to the copper oxidizing. I'm not exactly a fan of the light green the cables change to but it doesn't affect the overall performance and it is just a little annoying. Personally, this design works REALLY well. Half of the time the tips would remain in my ear when after I take the ASG-1's off. My thoughts when seeing the package: smart move! You have an accessory as a package, it's durable, safe and it's practical! Ok maybe not for portability, but it will survive ANY beating you can put it through. Step on it, throw it against the wall, throw it in water, you name it, it will probably survive it. Nothing too special in particular, you have six different tips, a cleaner and the almighty otter box. The most interesting about these IEM's is without a doubt their unique sound. as I have already stated in the top. Without EQ the performance varies from track to track, this exaggerates how this is a stage monitoring IEM where a sound engineer can modify the balance of the track for better playback. Generally, the tracks are played back with the vocals being the most prominent and upfront with the treble and bass further back in the background. But this boost in mids tends to throw off the balance of the recording with half my library and the sound that comes out is given a radio-like tone. The treble is easily the weakest link in the ASG-1's sound being pushed really pushed back and quiet. It is generally audible but there are a few situations where it becomes really difficult to hear the treble. The treble is really detailed but it lacks sparkle in most situations and sounds a bit dull in active songs. But this is not to say that sparkle is non-existent as a degree of sparkle is heard on more relaxed tracks like Hotel California by the Eagles. The most prominent but ambiguous part of the ASG-1 sound. The ASG-1 is a mid oriented headphone being designed for vocalists. 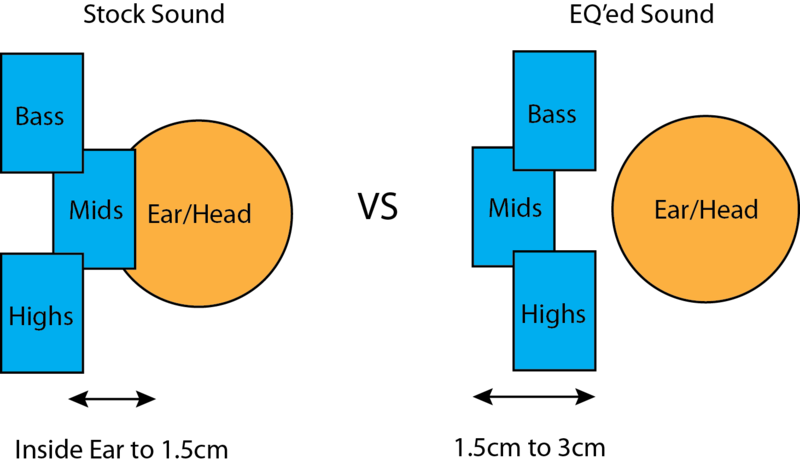 The goal of the mids boost is to push the mids in front of the bass and treble so it would be easier for the vocalist to hear himself. But here's the thing, the mids boost comes at a risk: Depending on the balance of the song, you might get a radio-like tone on your output sound (static-like may be one way to describe it as well). The soundstage is also impacted heavily by the mids boost: the mids are either in your face, or further away depending on your EQ. With the ASG-1's you really need to know the recording to get the best results. I found that the ASG-1 was extremely good with percussion instruments and always manage to give off a really prominent sound for every hit of the drums. Acoustic reproduction is also worth mentioning as I think it is done really well. When I listen to a song with both nylon and steel strings it is extremely easy to tell the difference on some tracks you can even hear the fingers sliding on the strings. To date, all dynamic IEM's I've heard have always had nice bass presentation and the ASG-1 does not disappoint. The bass on the ASG-1's are incredibly dynamic with plenty of punch and just about never bleeds. Overall it sounds extremely natural and it should have enough punch to satisfy most minor bassheads (with the use of EQ that is, EQ makes all the difference for me). These IEM's do bass and mid bass extremely well on bass solos it is you can hear the bass's resonance for a good three to five seconds. Sub bass is almost never a problem with dynamic IEM's and I find are generally heard or at least felt a lot more compared to balanced armatures of the same price. My personal favourite for demonstrating the power of the bass is the intro of Tell Me Baby by the Red Hot Chili Peppers. With the stock sound, it really doesn't sound like much but flip on the EQ and you get a really powerful bass intro. The soundstage is probably the most curious aspect of the ASG-1's right after the mids as it is highly dependent on whether you EQ or not. You see, when I first got the ASG-1's the soundstage was EXTREMELY small to my ears it felt like the sound comes from inside my ears to 1.5cm at most away from my ears. Switch on the EQ and this number goes to around 1.5 to 3cm. The mids boost really impacts the soundstage. This is all a matter of preference, but I can tell you now that most audiophiles will enjoy the EQed sound A LOT more then the stock sound as it brings back the mids boost to a more linear sound giving it more balance, increasing the soundstage and allows for the other instruments to shine through more. Personally, EQ is almost a necessity for me. I had the pleasure of talking to Dale and he explained the reason why the ASG-1 sound the way it does. The radio-like sound was intentional and it is actually a benefit for a vocalist. I'm sure everyone has noticed at one point or another that you sound different when you speak into a microphone and play it back. That is because how you hear your voice is not how others hear your voice. The ASG-1 are tuned so that a vocalist can hear their voice as it sounds to others. What Dale was trying to achieve when creating the ASG-1 was to create a sound that is similar to the sound your ears pick up if you were to channel the sound waves coming out of your mouth towards your ears which, if done correctly sounds a lot like how the ASG-1 would. Why is the Treble So Toned Down? The treble was toned down because of the sibilance a vocalist can experience during performances and/or recordings. Why would sibilance be a worry? I'm sure everyone has heard feedback when you put a microphone too close to the speakers and the speakers start outputting a really high pitch sound. Now imagine this sound being played back directly in your ears, it would rip your head apart. The ASG-1's are a really interesting and impressive IEM and it is something that I think competes really well in it's price range. It is really easy to see all the thought that went into the design of the headphone, from it's design to it's sound it is something that I really appreciate when I listen to these headphones.